Stan refuses to decorate one more egg for Easter until someone explains what eggs and bunnies have to do with Jesus dying for his sins. Kyle and Stan travel to the Vatican to get some answers and, on the way, become involved in an eccentric society that guards a biblical secret. As the Marsh family colors eggs for Easter, Stan questions what it has to do with Jesus. Not satisfied by his father Randy's vague response, Stan storms off and asks the same question to a mall Easter Bunny. The mall bunny tells Stan that it is "just Easter", and to "just go with it", then makes a mysterious phone call. Stan soon finds himself being chased by men in bunny suits. When he gets home, he finds that Randy is part of the plot. Randy calls the men off, and tells Stan that he is in a society called "The Hare Club for Men", who have guarded the secret of Easter for generations. Randy takes Stan to the headquarters of the Hare Club, where he is to be initiated into the group, which reveres a rabbit named Snowball. The Hare Club for Men's building resembles a Masonic Hall. Much of the ritual borrows from the practice of Freemasons. Just as he is about to learn the secret of Easter, Stan's initiation is interrupted as the club is ambushed by a group of ninjas. The Hare Club members rush to protect Snowball, and Randy gives the rabbit to Stan, telling him to run. He escapes with Snowball, and witnesses the ninjas and their leader, William Anthony Donohue, executing a resisting hare and interrogating Randy. Stan runs off to Kyle's house and tries to extract any knowledge Kyle has of Easter. Kyle, who is Jewish and says he knows nothing about Easter, does not want to be involved in something so dangerous, but Stan persuades him to help. Stan and Kyle manage to track down a man named Professor Teabag (spoof of Professor Teabing), who supposedly knows the secret of the Hare Club. Teabag lets them in his mansion and explains that Leonardo da Vinci was actually a member of the Hare Club and that Saint Peter was not a man, but a rabbit (Peter Rabbit), and reveals that da Vinci originally portrayed Saint Peter as a rabbit instead of as a man in his painting of the Last Supper. Teabag explains that Jesus knew that no human could speak for all Christianity without any acts of corruption, and that rabbits were pure, tolerant, and incorruptible. This is why the Pope's mitre is shaped to accommodate a rabbit's ears. He also explained that the Church decided to bury the secret and put a man in charge. Ever since, "The Hare Club for Men" society members have decorated eggs for generations to keep the secret in da Vinci's painting alive. He further explains that Snowball is actually a direct descendant from St. Peter, and that Stan's father and the members of the Hare Club have been kidnapped by the Vatican, who wish to cover up this secret, viewing it as blasphemy. Donohue's ninja minions then attack again and kill Teabag's butler, but Teabag helps the two boys escape by putting marshmallow Peeps in the microwave. It causes an explosion that destroys the mansion, killing both Teabag and the ninjas. 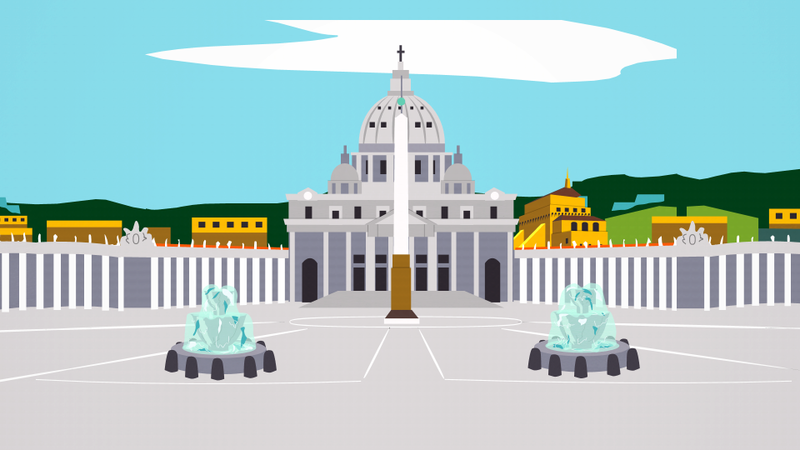 Stan and Kyle go to the Vatican where Stan turns the rabbit over to the Donohue's men, on the condition that the Hare Club members must all be set free and that Snowball remain unharmed. However, Donohue reveals he had actually made the promise on two separate crucifixes, a "double cross", and plans to make an example of the Hare Club. Pope Benedict XVI opposes this, saying that double-crossing is not considered to be "very Christian," something which Donohue responds by saying that it is what Jesus would have wanted. Jesus himself (after resurrecting from being killed in Iraq) then arrives to intervene, answering the prayer of one of the Hare Club members. He tells them that he actually did plan for the popes to be rabbits, citing the current corruption of Donohue. Benedict and his clergy are willing to listen and agree with Jesus, but Donohue refuses to listen and orders Benedict to execute Jesus for 'going against the Church'. Outraged to see how arrogant Donohue is, Benedict angrily refuses, saying that killing Jesus is not "very Christian." Enraged, Donohue seizes the Pope's mitre, and orders his ninjas to capture everyone including Benedict and Jesus. Donohue declares himself the new Pope. With the clergy unable to stop him, Donohue orders his minions to lock up Kyle and Jesus, whom he calls the "two Jews", and Benedict to deal with later. Donohue then leads Randy, Stan, and the surviving Hare Club members to the block where there is a gigantic pot for Snowball's execution. In the cell, Benedict apologizes to Jesus for his actions, pleading for forgiveness. Jesus tells Kyle that his "superpowers" only work when he is dead, and the only way to escape is for Kyle to kill him so he can return to life outside the cell. Kyle is hesitant to kill Jesus, as it goes against his beliefs, but does so after Jesus promises that "Eric Cartman can never know about this". As Donohue is about to execute Snowball in front of Randy, Stan, and the Hare Club members, the resurrected Jesus appears in the crowd. Jesus then kills Donohue by throwing a five bladed sword similar to the one featured in the movie Krull. Everyone cheers for Jesus and Snowball is elected Pope. Because he is a rabbit, Snowball cannot speak or tell people how they should lead their lives, just as "Jesus intended". Stan reveals that he has learned his lesson through all of his adventures: do not ask questions; just dye the eggs and keep his mouth shut, and Randy is proud of him.